Deborah Gottheil Nehmad’s Untitled, from 2003, is a study in obsession, pain, and the relationship between the two. Nehmad’s path to art has been an unlikely one. After an accident that resulted in severe injury, Nehmad was prevented from continuing her successful law practice. To keep herself productive and to facilitate the healing process, Nehmad took up the M.F.A. program in printmaking at the University of Hawai’i Manoa, from which she graduated in 1998. Since that time, her work has represented her attempts to quantify, categorize, and communicate the sensations of pain inflicted by her injury. Nehmad’s repetitive use of numerical figures has its origins in the oft-used system of describing pain on a scale of one to ten. In her work these numbers appear as an obsessive element repetitively scored onto the surface, thus including the viewer in Nehmad’s personal experience of chronic pain. Nehmad’s interest in creating a visual vocabulary for pain has also influenced her choice of printmaking and drawing processes. 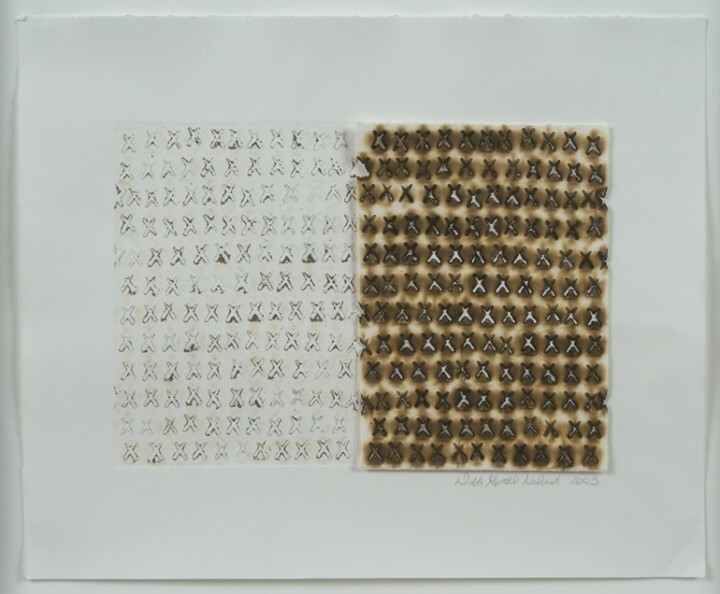 In the painstakingly placed X markings of Untitled, the viewer can observe Nehmad’s expert use of pyrography, the application of a heated object to create burnt marks, and collagraphy, in which a substrate of various textural materials is used to print either in intaglio or relief. These two processes combined create an even stronger relationship between the paper and the body of the viewer. The imprint of the burning technique evokes a searing sensation, as if the heated object is being applied to one’s skin rather than to the surface of the paper. This technique is particularly evocative in Untitled, in which the symbol Nehmad chooses to repeat is an X. The letter X brings certain images and ideas to mind, many of which seem applicable to Nehmad’s attempts to visually represent physical pain. For example, the phrase “X marks the spot” feels pertinent here, as the continual scoring of the letter X could be seen as an attempt to give pain a location, both on the body and on the paper. Additionally, an X can symbolize danger or inaccuracy–something to steer clear of or something wrong. In using this particular character, Nehmad demonstrates both the desire to locate her pain and the deep emotional toll of the body’s betrayal of the mind. Deborah Gottheil Nehmad (b. 1952, Brooklyn, NY) received her BA in Government from Smith College, Northampton, Massachusetts (1974), and her JD from the Georgetown University Law Center, Washington, DC (1982). After beginning a career as a lawyer, she earned her MFA in Printmaking from the University of Hawaii at Manoa (1998). Nehmad is a recipient of the Individual Artist Fellowship in Visual Arts from the Hawaii State Foundation on Culture and the Arts (2008), from which she has also received numerous Recognition and Purchase Awards, the most recent being in 2011. Nehmad’s work has been included in group exhibitions at such venues as the Hawaii State Art Museum, Honolulu (2007, 2010, 2011-13); The Contemporary Museum, Honolulu (2008); the Museo de Arte Contemporáneo Esteban Vicente, Segovia, Spain (2009); the Katonah Museum of Art, Katonah, New York (2011); The Contemporary Museum at First Hawaiian Center, Honolulu (2011); and the Honolulu Museum of Art (2012). Nehmad lives and works in Honolulu. More information about her work can be found at www.deborahnehmad.com. Lindsay Casale (b. 1987, FL) spent her formative years in Chapel Hill, North Carolina. She received her BA in English with a minor in Art History from James Madison University, Harrisonburg, Virginia. Casale currently resides in Brooklyn and works as a fundraising consultant for arts and culture and education institutions.